vacancies under Apprentices Act 1961 in GRSE ltd Recruitment are 261 posts. Candidates will be recruited for this Trade/ Technician/ Graduate Apprentices jobs is based on their marks scored in qualifying examination. Minimum age of the applicant for all posts is 14 years. Interested applicant can get the application for respective trade using the official website www.grse.nic.in. Application process for GRSE Trade/ Graduate/ Technician Apprentices begins from 07-12-2017 to 27-12-2017. 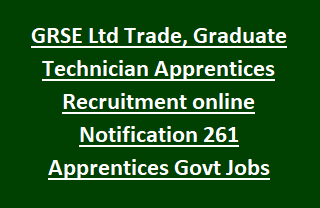 For more details of Garden Reach Shipbuilders & Engineers Limited GRSE Trade/ Graduate/ Technician Apprentices 261 govt jobs Recruitment application procedure, selection process, age limits, pay scale details are stated below. -Trade Apprentices (Ex-ITI): 150 posts. -Trade Apprentices (Fresher): 36 posts. Maximum age limit for Trade Apprentices (Ex-ITI) is 25 years. Maximum age limit for Trade Apprentices (Fresher) is 20 years. Maximum age limit for Graduate/ Technician Apprentice is 26 years. Trade Apprentices (Ex-ITI): Qualified All India Trade Test for Craftsmen training scheme with National Trade Certificate in respective trade. Trade Apprentices (Fresher): Qualified 10th class/ Madhyamik or equivalent examination. Graduate Apprentices: Degree in Engineering or Technology. Technician Apprentices: Diploma in Engineering or Technology. Check the GRSE notification for salary details. Candidates will be selected for Trade Apprentice (Ex-ITI), Technician/ Graduate Apprentices is based on the marks scored in qualifying examination in each trade. Selection for Trade Apprentices (Fresher) jobs is based on marks scored in 10th class/ equivalent examination. Detailed application procedure and official advertisement available at GRSE official website www.grse.nic.in. Read the full details of application procedure. Get the application for respective trade from the above website. Refer the guidelines for filling the application. Submit the GRSE application form through online begins from 07-12-2017. Last date to send application is 27-12-2017.